Destiny 2 offers players on all platforms a chance to try out the second shared-worlds shooter – and incidentally test Bungie’s network infrastructure, which the studio worries may melt under launch demand. The Destiny 2 open beta kicks off this weekend on PS4 and Xbox One. Pre-order early access went to PS4 and Xbox One pre-orders earlier this week, or to those who had early access codes. The time for getting an early start has been and gone, but you can check out when you can begin playing the Destiny 2 open beta by consulting the information below. We’ve listed the Destiny 2 open beta start times in PT, which is Bungie’s own timezone and the one it always refers to, as well as ET and BST. Live somewhere else? No worries. If you click the time links in the Destiny 2 start times details below, you’ll open a new tab showing the exact time in major cities in every time zone with daylight savings differences accounted for, making it easy to be certain you’ve got the correct information for your region. Activision Blizzard sent along the time and dates for the Destiny 2 beta during E3 2017, so we had all the details you’re after well in advance. No excuses for not having booked time off or planned a sickie! As expected, the Destiny 2 open beta has been extended beyond the initial end date of Sunday, July 23.
the test is now expected to close at 6:00pm PT July 25/9:00pm ET July 25/2:00am UK July 26. Bungie has not mentioned any plans to open additional content during the extension as it did for the first Destiny open beta, but has warned ti will be doing some testing which may impact performance. Having initially only vaguely sketched out its plans, Bungie revealed the full Destiny 2 open beta content two weeks before kick off. Playing solo or in co-op, Destiny 2 open beta testers can try out the Homecoming mission shown at the Destiny 2 reveal event, matchmake or group up for the Inverted Spire strike, and check out two Crucible (PvP) modes, Countdown and Control, on two maps, Midtown and Endless Vale. You will need PlayStation Plus or Xbox Live to participate in the Strike and Crucible activities in the Destiny 2 open beta. Countdown: Battle other Guardians in a brand new Crucible mode. Attack or Defend the base on a new map custom-built to support this new game type. Control: The original standard for Crucible combat is back, with some changes. Control the zones on another new map built with this objective in mind. The Inverted Spire: Strike at the heart of a Vex stronghold. Bring two willing allies, or let Matchmaking introduce you to a Fireteam of Guardians. New Subclasses: The new fighting style for each Class will be at the ready. Choose from the Dawnblade and Voidwalker for the Warlock, Arcstrider and Gunslinger for Hunters, or Sentinel and Striker for the Titan. 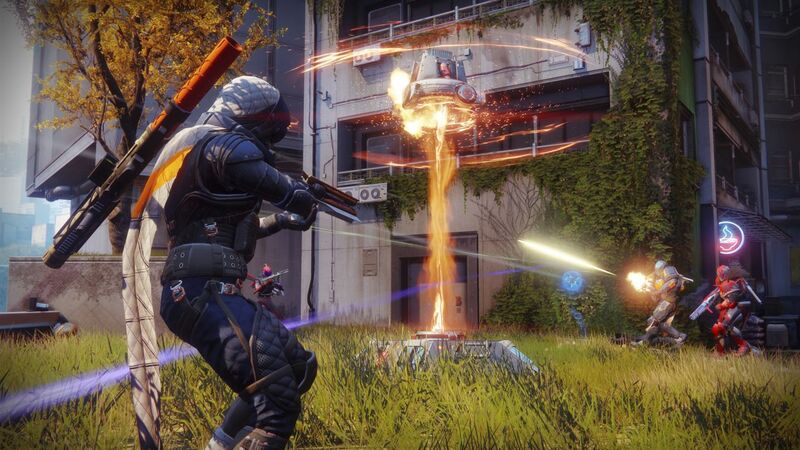 Weapons and armour: the beta will feature over 20 weapons, including three Exotics (Sweet Business, Sunshot, and Risk Runner), and three armour sets for each class, for a total of nine. The strike, and both Crucible modes support matchmaking, but the story mission is only playable in single-player. The download size for the PS4 beta is 15GB, and 13GB on Xbox One. On Xbox One, you only need to free up 13GB, but on PS4, you’ll need at least 30GB of free space. This is needed for the download to start, after which the system should automatically release the remaining space. The Destiny 2 beta client has been available for preload since July 13, but has been updated since first release. Make sure to log into your console well in advance of the test kick-off time and check for updates to ensure you have the latest version. Destiny went down for extended maintenance a few weeks before the Destiny 2 beta. Since we know there will be no major updates to Destiny moving forward, this suggests Bungie is preparing its technology for the onslaught. We expected to see a few more bursts of downtime before the beta, and indeed Bungie announced another outage on July 13 – two hours between 8:00am PT and 10:00 PT. We may see further windows of Destiny downtime after it closes. Bungie released a list of problems that you may encounter in the beta. It’s not a big list, but it’s worth taking a look at. When announcing the Destiny 2 beta times and dates during E3 2017, Activision Blizzard also confirmed Destiny 2 releases September 6 on PS4 and Xbox One, two days earlier than anticipated. The PC version of Destiny 2 will release on October 24, the publisher added. As ever, our Destiny 2 guide is freely available if you want to learn more about Bungie’s next big thing. It’s got subclass guides for the four we’ve seen so far, details on Exotics, and explanations of the new ammo and weapon systems. Bone up before the Destiny 2 open beta.